Today is the first day of Black History Month in the U.S., a day when some pretty savvy college kids made history 56 years ago. Today’s youth would say these guys had game. On February 1, 1960, four black students from North Carolina A&T State University sat down at the “whites only” lunch counter inside a Greensboro Woolworth store. Although they were refused service, they stayed until closing. More joined them over the next few days and sit-ins spread to other North Carolina cities. On July 25, 1960, after losing $200,000 in sales to boycotts, the Greensboro store abandon its segregation policies. Four years after the Greensboro Four (Joseph McNeil, Franklin McCain, Ezell Blair, Jr., and David Richmond) staged their sit-in, The Civil Rights Act of 1964 mandated desegregation in all public accommodations, including beaches, libraries, parks and museums. 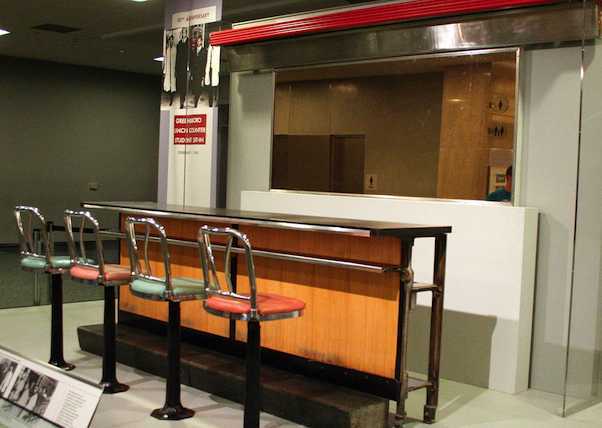 A section of the lunch counter from the Greensboro Woolworth (pictured, above) is preserved in the Smithsonian Museum of American History, and the original building at 132 South Elm Street now houses the International Civil Rights Center and Museum.